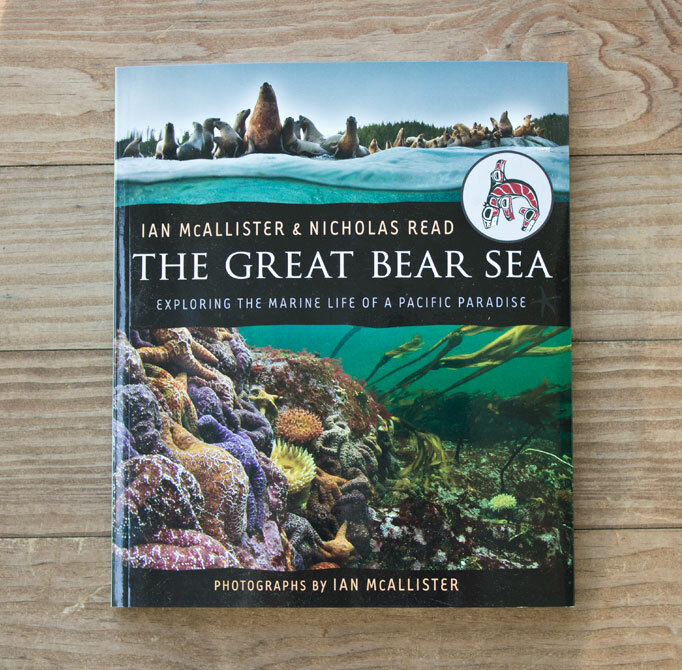 Great Bear Books is a collection of three books about the natural history of the Great Bear Rainforest in British Columbia, with the goal of raising awareness about this precious ecosystem and the threats that endanger its survival. 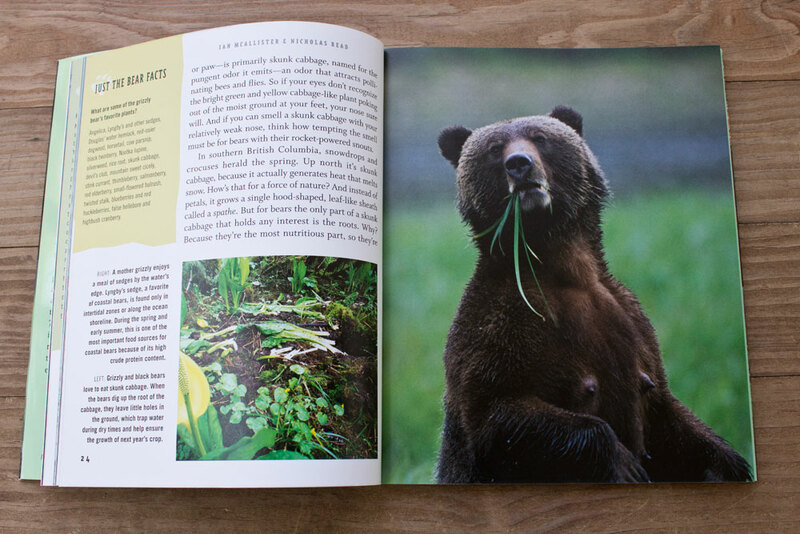 These books will make your feet itch for a visit to Canada’s coastal rainforest. 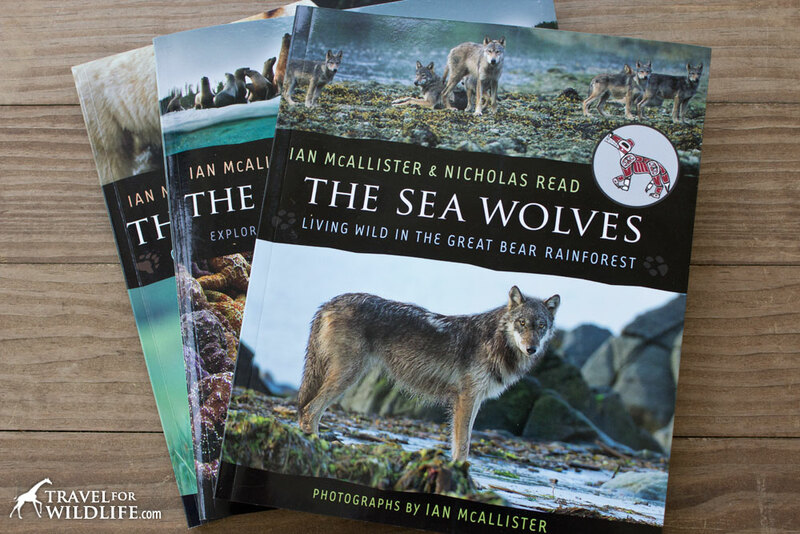 All three volumes feature the incredible photography of Ian McAllister, an award-winning photographer and filmmaker and a founding director of Pacific Wild and Raincoast Conservation Society. 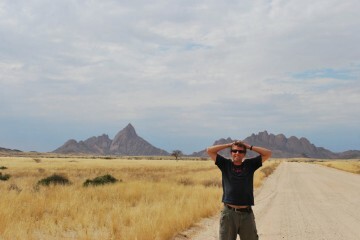 He has been working for over 20 years toward the preservation of this pristine land. The conversational text is written by Nicholas Read, a journalism instructor at Langara College in Vancouver. This series of naturalist’s books have been classified as juvenile literature, designed as an educational tool for use in schools. But don’t let that fool you! You don’t have to be a teenager to enjoy them. You won’t get bogged down with dense scientific explanations, and this is what I really liked about these books. I didn’t find the usual numbers and statistics that tend to make me yawn. 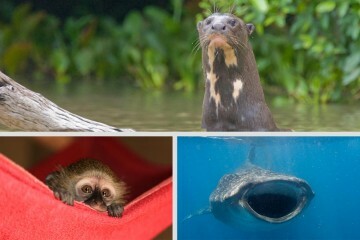 Just interesting facts and amazing photography. 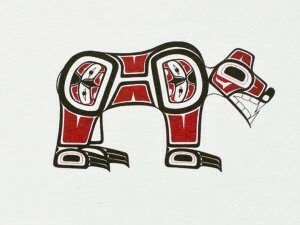 Beautiful artwork by Martin Campbell, a Heiltsuk artist, complements the text and photographs. If you are a teacher, take a look at the teacher guides and resources available at the Great Bear Books site. The Sea Wolves is ERAC approved. ERAC is a consortium of British Columbia public school districts and independent schools that work together cooperatively. The goal is to ensure that BC K—12 schools have access to appropriate learning resources. An excellent book for anyone who wants to learn about the bears of the Great Bear Rainforest. Black bears, grizzly bears and spirit bears (a pale color variety of black bear) inhabit this pristine ecosystem. 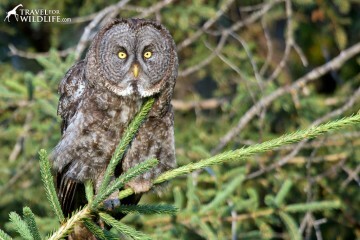 They are all key players in the circle of life which includes the sea, the forest, and the salmon. 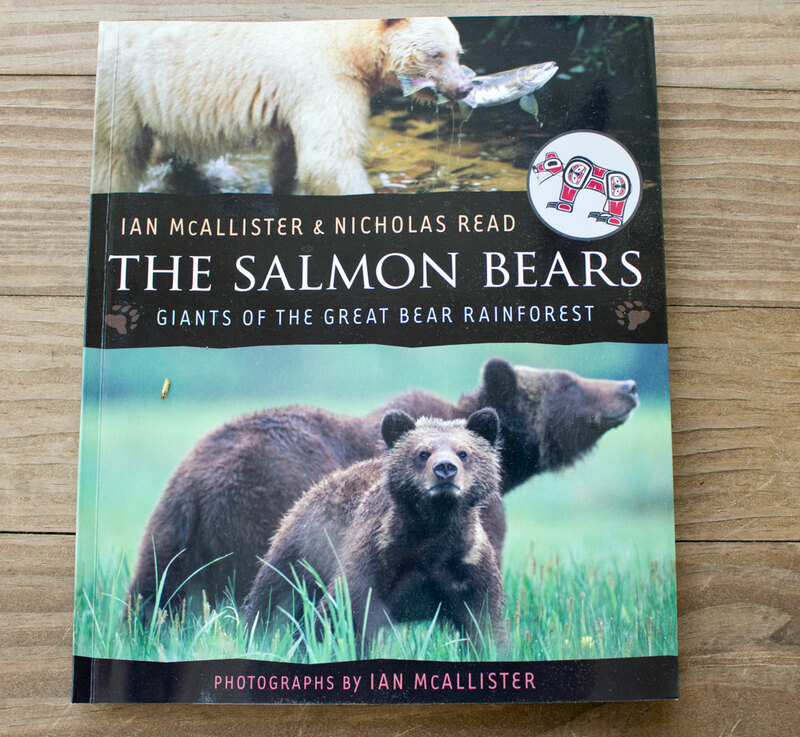 The Salmon Bears takes you on a journey through a bear’s life, starting with newborn cubs at their den during the winter. 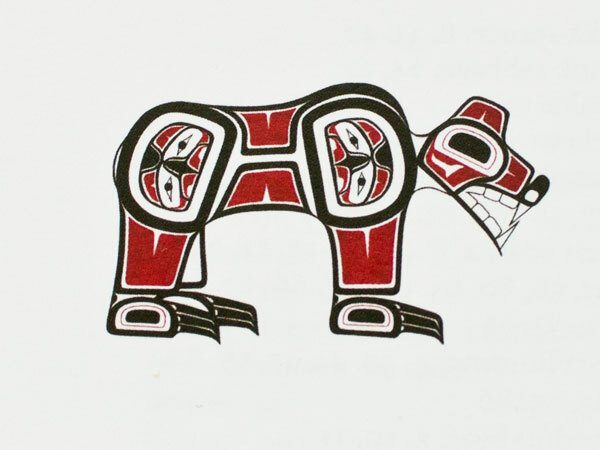 The first of the Great Bear Books also highlights the uncertain future that these bears face. Habitat loss, diminishing wild salmon stock, and the controversial BC bear trophy hunt are very present threats to the bear population. I’ve had my eye on this book for a while. I’ve always loved wolves. The whole reason I got a degree in zoology was to study them, but I didn’t know much about the swimming wolves of British Columbia (they are genetically distinct from any other wolf population). When I think of salmon I immediately think of grizzlies feasting on them. 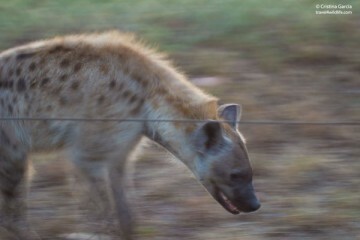 But it never occurred to me there was a population of wolves doing the same thing. 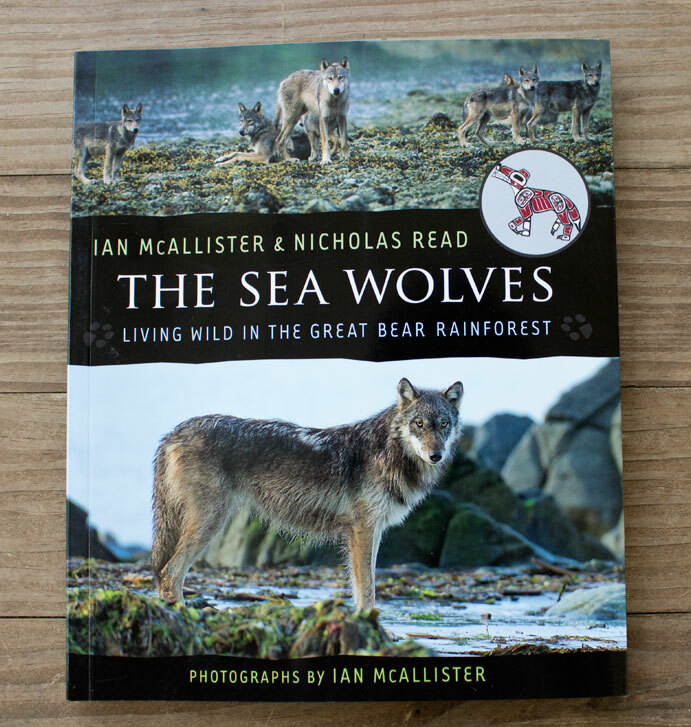 From the birth of new wolf pups in a cozy den under an old western red cedar tree, to surviving through the winter, the Sea Wolves takes the reader through a year in the life of wolves, hunting deer and fishing for salmon. 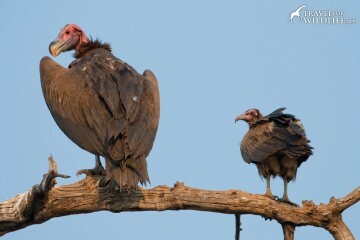 It also highlights the relationship between wolves and ravens and between wolves and the humans that live in the Great Bear. What will happen to the coastal wolves? The many threats that hang over them (road building, clear-cut logging, trophy hunting, diminishing wild salmon stocks, and the oil industry) make the future of the swimming wolves unclear. When you think of a Pacific paradise, you probably envision white sandy beaches on Vanuatu or Hawaii. And that is what I would have thought of too, until we visited the Great Bear Sea while staying at Nimmo Bay. 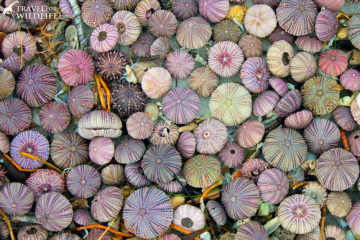 Picture colorful sea stars, huge kelp forests, prolific salmon, playful seals, and hunting orcas. 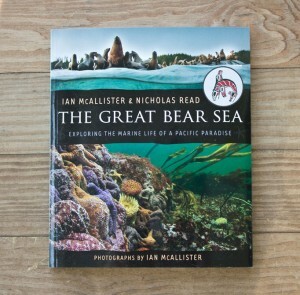 There is so much life in the Great Bear Sea, and so much of the Great Bear’s terrestrial life depends on it! The book takes us on an extraordinary underwater journey. 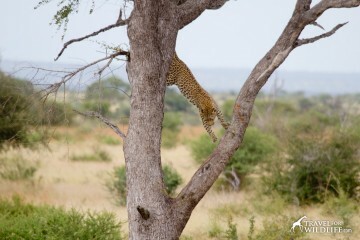 It starts with the little creatures builds its way up the web of life. From the alabaster nudibranchs (predatory sea slugs) that seem to glow in the dark, all they way up to the great orca whales. The role of salmon and herring in this ecosystem is highlighted in a chapter of its own. I have a confession: I never knew how important herring were until I read this book! This is a beautiful work. After you read this one, you’ll want to swim between the kelp like a seal! Disclosure: We were supplied with the books in exchange of our honest review.